UBCF’s GOAL is to support Every Woman® and to raise awareness of male breast cancer. In 2018, an estimated 2,470 men will be diagnosed, and 460 men will die from breast cancer. UBCF encourages women and men to be self-aware. The United Breast Cancer Foundation (UBCF) is proud to have their print Public Service Announcement (PSA) message, “BLOCK OUT Breast Cancer”, featured in the Official 2018 NBA All-Star Game Program. The 2018 NBA All-Star Game Weekend, held in L.A. at the Staples Center, starts this Friday, February 16 with the Star Studded All-Star Celebrity Game, and concludes on Sunday, February 18 with the 67th NBA All-Star Game at 8 pm EST. Coverage begins at 7 pm on TNT. 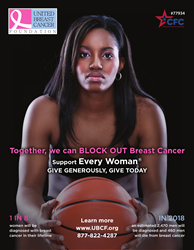 UBCF’s print PSA features captivating imagery of UBCF's female basketball player, “Together, we can BLOCK OUT Breast Cancer” which includes educational facts and statistics about female and male breast cancer. UBCF’s GOAL is to support Every Woman® and to raise awareness of male breast cancer. In 2018, an estimated 2,470 men will be diagnosed, and 460 men will die from breast cancer. UBCF encourages women and men to be self-aware. Learn the male self-breast exam – download here. As in years past, fans select the All-Star players. This year, the NBA debuted a new All-Star Team selection by Team Captains MVP's LeBron James and Steph Curry drafting their All-Star teams. LeBron James set the tone with the first pick, Steph Curry the second, and so on until the rosters were set. The All-Star Team roster includes: LeBron James, #23, Cleveland Cavaliers, Steph Curry, #30, Golden State Warriors, Kevin Durant, "KD", #35, Golden State Warriors, Giannis Antetokounmpo, #34, Milwaukee Bucks and James Harden, #13, Houston Rockets. UBCF is further increasing its mission’s reach with the print PSA “We Support EVERY WOMAN®”, placed on page 33 of the USA Today 50th Anniversary of Dr. Martin Luther King Jr. Black History Month Special Edition. LeBron "King" James is featured on the cover of the USA TODAY Special Edition and is featured in the article, " 'King James' Inspired by the Real King". LeBron is quoted as saying this about Martin Luther King Jr., "He was raising awareness because he believed in order for people to grow, we all need to come together no matter the skin color, no matter who you are or where you're from." UBCF is working to do the very same thing for women and men affected by breast cancer - Together, we can BLOCK OUT Breast Cancer! UBCF is committed to offering breast health and wellness services focused on cancer prevention, screening, treatment and overall wellness. UBCF’s mission is to make a positive difference in the lives of those affected by breast cancer and carries it out through seven life-supporting patient and family programs available to women, men and families nation-wide. UBCF never denies services to anyone regardless of age, race, gender, ethnicity, income or medical insurance coverage. If you are in need of breast health services, please visit ubcf.org or call toll-free, 877-822-4287. Tax-deductible contributions may be made towards UBCF’s programs. UBCF accepts vehicle and property donations as well. Contributions may be mailed to UBCF, P.O. Box 2421, Huntington, NY 11743, or donate through the Combined Federal Campaign, #77934.